Dr. Andreas Kramer is a Clinical Associate Professor in the Departments of Critical Care Medicine and Clinical Neurosciences. He graduated from medical school at the University of Manitoba in 1997 and received specialty training in internal medicine and critical care at the University of Calgary 1997-2002. After working for three years as a community internist and intensivist in Manitoba, he obtained fellowship training in neurocritical care at the University of Virginia 2005-2007. During this time, he also completed a Master of Science degree in Health Evaluation Sciences. 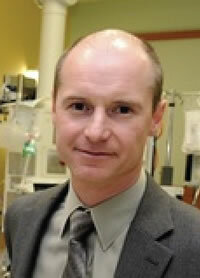 Dr. Kramer joined the Department of Critical Care Medicine in Calgary in 2007. Particular research interests include the prevention of secondary brain injury in neurocritical care patients; improving accuracy and transparency of neuroprognostication; and promoting excellence in organ and tissue donation. Dr. Kramer is on the Editorial Board of the journals Neurocritical Care and Critical Care Medicine. He has over 70 peer-reviewed publications, with more than half of these as first or senior author. He has also written multiple textbook chapters on a variety of topics, and was the co-editor of two 2017 neurocritical care editions of the prestigious Handbook in Clinical Neurology. Since 2011, he has been the medical director of the Southern Alberta Organ and Tissue Donation agency, and has served on numerous Canadian Blood Services advisory committees. Dr. Kramer is married with four very energetic children between the ages of 7 and 14.